The Mercury Cougar has been reinvented many times, but we've only seen a couple of incarnations in this series. We've seen the lean and mean '68 Cougar and the Bloated Final Year Of The Rebadged Mustang Cougar, but what about the Farrah Fawcett-Approved Cougar? I found this appealingly rough '75 parked across the street from the '82 280ZX Turbo and quite close to one of Alameda's non-Buick Skyhawks. This car definitely runs and drives, but with gas prices closing in on five bucks there's no telling how much longer it will be possible for its owner to quench the thirst of its 351, 400, or 460. Now that's class! A Cougar emblem in the little opera window! 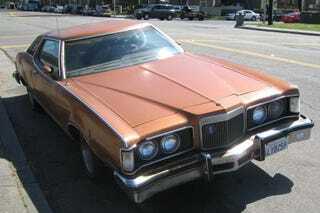 See, the Malaise Era wasn't entirely about diminished expectations- you could get down and funky with that special someone in the luxurious vinyl comfort of your Cougar's back seat, while the same activities in a cramped 60s Cougar would be more like a game of Twister inside a packing crate. Don't forget the Acapulco Gold and Foghat on the 8-track! Sadly, those mean ol' bean counters at FoMoCo decreed that the super-cool sequential turn signals would be axed for this generation of Cougars, but the full-width taillights were partial compensation.